BINUS UNIVERSITY INTERNATIONAL is fortunate to be part of the Talking ASEAN – the business series; a consortium between the Habibie Center, the Coordinating Ministry of Economic Affairs of the Republic of Indonesia, the AEC Corner – Ministry of Trade of the Republic of Indonesia, Himpunan Pengusaha Pribumi Indonesia (HIPPI), and the Indonesian Services Dialogue Council (ISD). This new Talking ASEAN series will focus on issues pertaining to ASEAN’s economic cooperation, as well as other important sectors such as regional cooperation, labor and law issues, and other business-related context. 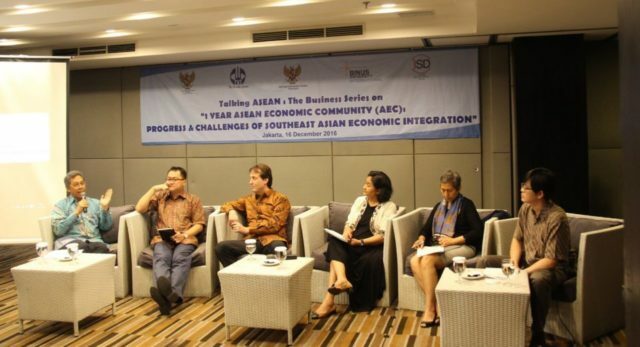 Aside from strengthening awareness, knowledge, and understanding about ASEAN and its activities, especially with regard to opportunities and challenges around the Association’s socio-economic cooperation, to stakeholders, this initiative is also aimed at instilling ASEAN entrepreneurial spirit amongst the youths, especially those in Indonesia. The BINUS UNIVERSITY INTERNATIONAL and the Coordinating Ministry for Economic Affairs will take turn in hosting the organization of this initiative.